The Global Volcanism Program has no activity reports for Frosty. The Global Volcanism Program has no Weekly Reports available for Frosty. The Global Volcanism Program has no Bulletin Reports available for Frosty. 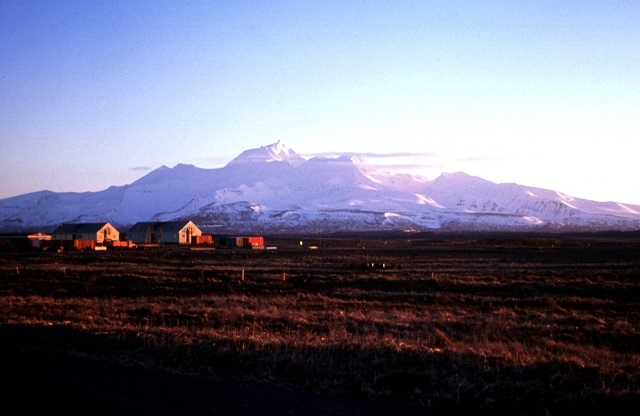 Frosty Peak, the youngest of two large volcanic structures of the Cold Bay Volcanic Center, is the westernmost Holocene volcano on the Alaska Peninsula, SW of the village of Cold Bay. This symmetrical late-Pleistocene to Recent stratovolcano is constructed within one of two coalescing craters. The western wall of the ice-filled northern crater is breached by a large valley glacier. The symmetrical summit cone rises about 600 m above the floor of the southern crater. The oldest products of the roughly 100 km3 Cold Bay complex form the late-Pliocene to early Pleistocene Morzhovoi Volcanics at the southern end. Morzhovoi is an extensively eroded basaltic-to-andesitic stratovolcano with long U-shaped valleys extending from a central caldera. Only remnants of the volcano remain, with isolated peaks, such as North and South Walrus Peaks, that are fragments of the original caldera rim. Brophy J G, 1987. The Cold Bay volcanic center, Aleutian volcanic arc. II. Implications for fractionation and mixing mechanism in calc-alkaline andesite genesis. Contr Mineral Petr, 97: 378-388. Waldron H H, 1961. Geological reconnaissance of Frosty Peak volcano and vicinity, Alaska. U S Geol Surv Bull, 1028-T: 677-708. The Global Volcanism Program is not aware of any Holocene eruptions from Frosty. If this volcano has had large eruptions (VEI >= 4) prior to 10,000 years ago, information might be found on the Frosty page in the LaMEVE (Large Magnitude Explosive Volcanic Eruptions) database, a part of the Volcano Global Risk Identification and Analysis Project (VOGRIPA). There is no Deformation History data available for Frosty. There is no Emissions History data available for Frosty. Frosty volcano is the youngest of two large volcanic structures of the Cold Bay volcanic complex, about 15 km SW of Cold Bay at the tip of the Alaska Peninsula. Frosty Peak is a symmetrical late-Pleistocene to Holocene stratovolcano that is constructed within the southernmost of two coalescing craters and forms the high point of the volcanic complex. Photo by Christina Neal, 1997 (Alaska Volcano Observatory, U.S. Geological Survey). There are no samples for Frosty in the Smithsonian's NMNH Department of Mineral Sciences Rock and Ore collection. Large Eruptions of Frosty Information about large Quaternary eruptions (VEI >= 4) is cataloged in the Large Magnitude Explosive Volcanic Eruptions (LaMEVE) database of the Volcano Global Risk Identification and Analysis Project (VOGRIPA).